1. Replace Excelsior, Ambassador, and New Orleans class Starships as the primary instrument of Federation deep-space defense. 2. Provide a mobile platform for a wide range of ongoing scientific and cultural research projects. 3. Provide autonomous capability for full execution of Federation defensive, cultural, scientific, and explorative policy in deep space or border territory. 4. Serve as a frontline support vehicle during times of war and emergencies. 5. Provide a mobile platform for testing and implementation of mission-specific or new technology of any kind. Hull: Duranium-Tritanium composite with micro-fiber reinforced ablative armor over critical compartments. Number of Decks: 18 Total, 17 Habitable. The Akira Class starship entered service in 2364 and has quickly become the pride of Starfleet’s next generation of starships. Akira Class vessels are part of the new belief that smaller, faster, more maneuverable Starships are needed to better serve Starfleet's, and, by extension, the Federation's needs. Initial production of the Akira class began at the ASDB Integration Facility, New Aberdeen Fleet yards, Aldebaran, and has since expanded to include the ASDB Integration Facility, Utopia Planitia, Mars where nearly 15 of these vessels enter service each year, and the newly revamped Atlas V Assembly Facility, Deneb V along with the Antares Fleet yard. Unlike many larger starships of its development era, with saucer separation as a prerequisite, Akira Class vessels to date cannot separate into two vessels. As a result, the Akira Class no longer has the twin hull design that has been seen in vessels such as Excelsior, New Orleans, Galaxy and Ambassador Classes. This means that the primary hull and the engineering hull are no longer separate, with no "neck" section. While this division of Saucer and Stardrive has been blurred, it does allow the Akira Class to make a smoother, less polluted entry into subspace during Warp. Also, because of this "no stardrive" design, the surface between the two hulls has a much more gradual descent and streamlined appearance; the dorsal mid-ships section, which slopes up where the two hulls connect. The Akira space frame appears very similar in design to that of an ancient earth sailing boat known as a Catamaran. With the Nacelles parallel to the main hull, they can be more adequately protected by the primary and secondary shield generators with only a minimal loss in shield efficiency. The final armaments for the Akira Class were finalized during the end of the primary development phase and implemented during the vessel's first production contract at both ASDB Facilities. Realizing that relations with the Cardassians was going to deteriorate before they improved, and the looming presence of a Borg incursion, Starfleet requested that a portion of the new Akira’s be refitted with more weaponry and upgraded shields. The resulting Akira class mounted no less than 15 Photon torpedo tubes spread between 3 launchers scattered around the vessel [2 located on the Aft sail, and 1 mounted on the ventral portion of the vessel just above the main deflector]. Heavily armed, the design philosophy for the Akira class created lessons later utilized in the Defiant Project, especially the early “Torpedo Gunboat” design that was later scrapped in favor of the current design. A Combined Forward/Aft torpedo bay is located both along the Aft Dorsal "Sail" portion of the hull, while a second set of forward launchers are located just under the nose of the ship. Combined with the Type X phaser array, the current Akira class is heavily armed, and in raw torpedo firepower, could return fire - torpedo for torpedo, with the vaunted Galaxy / Nebula Class launchers. With the Saber class designed to replace the Miranda and her sister classes (Soyuz, etc) of starships on internal police patrols, and with the Merced and New Orleans Class functioning adequately in the role of Mission-Specific Frigate, it was a waste of scientific resources to assign those classes to defensive patrols on the Cardassian Frontier where they were clearly outgunned against Galor class Battle cruisers. Akira class starships were outfitted with a full-fly through hangar on deck 12 from which no more than 40 Kaneda Class fighters could be launched, combined with the 3 photon torpedo launchers and 6 Type X phaser array’s standard on the Akira class, gave the carrier impressive sublight combat capabilities and could stand toe-to-toe against even the most determined Cardassian attack. Starfleet Command issued a request to the major fleet yards in 2353 for a design and engineering specifications for a new Heavy Cruiser to supplant the Excelsior and Ambassador Class starships as the primary instrument of Federation defense. The production contract was awarded to the New Aberdeen Fleet yards in the Aldebaran system, with the now infamous Yoyodyne Propulsion Systems as the primary engineering firm. Starfleet Command requested, specifically, a smaller, more heavily armed and most importantly quicker constructed vessel than the Ambassador Class, without sacrificing firepower or shielding. This stipulation was no small request, as the Ambassador Class vessel was by far the most heavily armed and armored vessel Starfleet could field at the time. She was also the largest class in Starfleet history, until the launch of the Galaxy Class, and was also the most crew intensive in service. The first test hull, now dubbed the USS Akira by the development team after the project name, was laid in 2356 and basic compartmentalization was completed two years later, when the Consolidated Fusion Inc. M/ARA core and nacelle structure was installed. Due to the unique configuration of the hull, along with the layout of the deck space, which was unique compared to the Ambassador, Merced, Excelsior, and most other vessels of its classification, the standard General Propulsion Mark VI Impulse Plant and Malkinalis 8.5 M/ARA warp core used in the upgrades on the Excelsior Class and the Merced class Frigate, the standard Impulse and M/ARA configuration at the time, had to be abandoned (as it would later with the Steamrunner Project). The Akira hull, assigned the registry NX 62497, launched from the New Aberdeen fleet yards in the spring of 2358 for warp core testing. At the time of her warp core and engine testing, she was unarmed, with plans for Type VIII phaser arrays planned for deployment aboard the class, along with two photon torpedo launchers. The USS Spann [Excelsior Class - NCC 3995] and the USS Zachary [Miranda Class - NCC 2311] escorted the Akira hull from her berth to deep space for trials. The Akira hull did not reach Warp 3 before the safety cutoffs dropped the hull from warp - under emergency power, she was towed back to the New Aberdeen Fleet yards for review. Simulations could not determine the exact cause of the error. Two more tests gave the same results - the hull was decompartmentalized and the structural framework went into review. After this in-depth analysis, the Akira project design team rejected Consolidated Fusion Inc.’s M/ARA and Impulse engine design, after three Time trials utilizing the CFI M/ARA configuration, strong and potentially damaging hull stress fractures occurred within the main structural network. It was determined that the warp harmonics generated by the Core was the cause of the damage, and the CFI M/ARA unit was scrapped (the design was later picked up by the Steamrunner project). The Project Akira hull, along with its two half-completed sister ships were put into cold storage for nearly 5 years. It wasn't until the development and widespread utilization of technologies found in the TPG Matter/Anti-Matter Reaction Drive, by Theoretical Propulsion Group, that the Akira Project was revived. The new warp cores for the Galaxy Class utilized the latest in Plasma Induction and Warp Harmonic Control to create a stable, powerful warp core, and with Project Akira's unique hull configuration, was a must if the vessel was to see active duty. Project Akira took a new Ramjet Mark I off of the assembly lines, updated it with the technologies developed by Theoretical Propulsion Group, which meant they had to abandon the traditional vertical warp core, instead using the horizontal mounting reminiscent of the Constitution-Refit class. The resulting configuration completely eliminated the shearing forces created by the warp core, while also reducing deuterium usage by nearly five percent in comparison to the original configuration. To increase the combat efficiency of the Akira class, Yoyodyne propulsion systems lead designer Alex Jaeger proposed the addition of two additional torpedo launchers, each armed with 5 tubes, to be located both in the dorsal and ventral portion of the main dish hull and fixed to the forward firing arc. 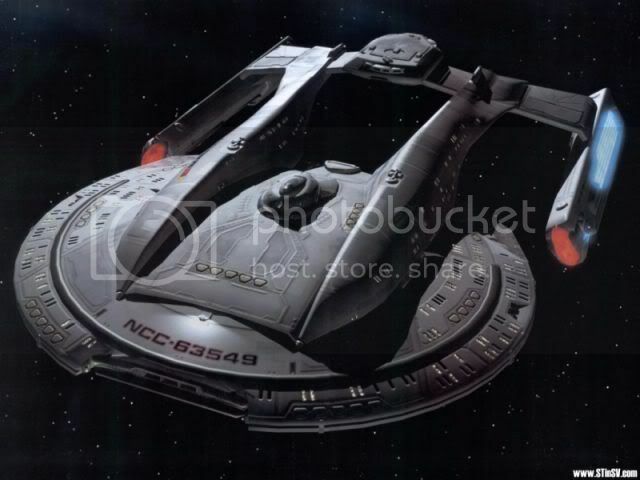 This would give the Akira class tremendous firepower in the forward firing arcs and could overwhelm even the vaunted shielding of the Cardassian Galor class battle cruiser, a vessel that clearly outgunned the Akira class before the redesign, and was a match for both the Excelsior and Ambassador class starship. With a total of 15 torpedo tubes, the Akira Class earned the distinction of being the first vessel in Starfleet history to rely on the Photon Torpedo, not the Phaser, as her primary armament. Further, the phasers were upgraded from Type VIII to Type X in mid-production - no Akira Class vessel ever entered service officially with anything less than a Type X phaser array. NX 62497 left the New Aberdeen Fleet yard Facility in 2363 for final Impulse engine stress testing near Wolf 359, flanked by the USS Ottawa [Excelsior Class - NCC 3299] and the USS Unification [Ambassador Class - NCC 19995]. Stress tolerances were well within expected levels, and the hull returned to Aldebaran for final interior compartment completion. The hull, named the USS Akira, had final compartmentalization completed on March 15, 2364 and took its final shakedown cruise through April 29, 2364 when she arrived at Sol system for its official launch. By the time the USS Akira entered into service in 2364, her sister ship, the USS Beijing NCC 62498 was nearing completion at New Aberdeen, with no less than 10 more hulls being prepared for construction at both the Utopia Planitia Fleet yards and the New Aberdeen Fleet yards. At the height of production, the New Aberdeen Fleet Yards, the Balkinur Cosmodrome and the Atlas V Fleet yards of Deneb V were producing Akira Class vessels. Additional construction contracts were issued to the larger Utopia Planitia and the Antares V Fleet yards. The USS Akira and her sister vessels were immediately dispatched to both the Romulan Neutral Zone and along the Federation/Cardassian Border. The Akira class was favored by many a Captain for being a durable and dependable vessel, thanks in part on being built using standardized Federation components already tested and deployed successfully in no less than three classes of vessels. With the advent of the Borg threat, along with increased tension between the Federation and the Cardassians, the Akira class was designated to more and more defense and patrol related duties, leaving the Nebula class to serve as the Diplomatic and Exploratory arms of Starfleet. Further, the deployment of the Kaneda Class Space Superiority Starfighter, mounting Micro-torpedoes and Type VI Shuttle class Phaser Emitters, extended the range of the Akira class and provided unprecedented sub light combat capabilities and intelligence gathering capabilities. With Excelsior Class vessels taking staggering losses, and clearly outgunned when faced against Dominion Battleships, Starfleet reissued production contracts for the Akira class. It was a proven design, heavily armed for its size, and was well-suited for combat against Dominion Threat vessels. Production of the Akira class fell on Antares V Fleet yards, Utopia Planitia, the Copernicus Fleet yard, and the newly revamped New Aberdeen Fleet yards, where production continues to this day. Several small modifications have since been made to the refit specifications on the Akira Class, including the addition of EMH technology in Sickbay and Ablative Armor to the nacelle and aft sail assembly, to further increase combat survivability. After the war, most Akira Class vessels had their Fighter Wings transferred to fixed orbital facilities or ground based Starfleet or Allied Facilities to allow for additional cargo space and the addition of modular laboratories installed into the unused Hangar space. This gave the majority of the Akira class laboratories and, most of all, doubled the normal load out of sensor probes, making the class a premier exploration vehicle with half of the crew and construction costs of a Galaxy or Sovereign Class Starship. Phaser array arrangement: Two dorsal phaser arrays on the primary hull, extending from just aft of the bridge to almost midway around the saucer section. The arrays converge to intersect at the bow of the ship, giving them an almost oval appearance. Two ventral phaser arrays on the primary hull, extending from the very back of the primary hull almost to the bow. These arrays also converge gradually as they approach the widest part of the primary hull, converging near the bow. Two phaser arrays are located on or near the aft sail covering the rear firing arc. Phaser Array Type: The Akira Class utilizes the Type X array system. The seven arrays are all type X, the new standard emitter. Each array fires a steady beam of phaser energy, and the forced-focus emitters discharge the phasers at speeds approaching .986c (which works out to about 182,520 miles per second - nearly warp one). The phaser array automatically rotates phaser frequency and attempts to lock onto the frequency and phase of a threat vehicle's shields for shield penetration. Arrangement: Three fixed-focus torpedo launchers, one located just above the main deflector dish and another at the bow of the primary hull along with a third launcher within the main sail. These launchers are the second generation of automated, high-speed launchers originally developed and found on the New Orleans and Saber Class (and later seen aboard Excelsior Class Starships as part of their refit schedule) starships and each launcher is armed with 5 tubes per launcher, giving the Akira Class the ability to launch up to fifteen torpedoes in a single salvo. The third generation of this launcher has seen deployment aboard the Sovereign Class and Norway Class. Type: Mark XXV photon torpedo, capable of pattern firing (sierra, etc.) as well as independent launch. Independent targeting once launched from the ship, detonation on contact unless otherwise directed by the Chief Tactical Officer or TIC Weapons Officer. Payload: The ship can carry a maximum of 375 torpedoes. Type: Ramjet Mark 1 Standard Matter/Anti-Matter Reaction Drive, developed by Ramjet Propulsion. Information on this Warp Drive can be found in any Starfleet Library or Omnipedia. Note: Vessels equipped with the Ramjet Mark 2 series M/ARA Drive System no longer have the maximum cruising speed limit of Warp 6.3, thanks to innovations discovered and utilized in the General Electric Type 8 M/ARA Warp Drive outfitted in the new Sovereign Class Starship. Pursuant to Starfleet Command Directive 12856.A, all Starships will receive upgrades to their Warp Core system to prevent further pollution of Subspace. To date, all vessels currently in service have received these upgrades. Type: Standard Akira Class mass drivers developed and built by HighMPact Propulsion. Output is comparable to Ambassador Class. Output: Each engine (there are two impulse engines) can propel the Akira Class at speeds within the area known as Standard impulse operations. These speeds are limited to a maximum speed of .25c, with each engine working at .125c, due to time dilation problems. Quarter impulse is rated at .0625c, half impulse being .125c and full impulse is rated at .25c or 1/4th the speed of light.